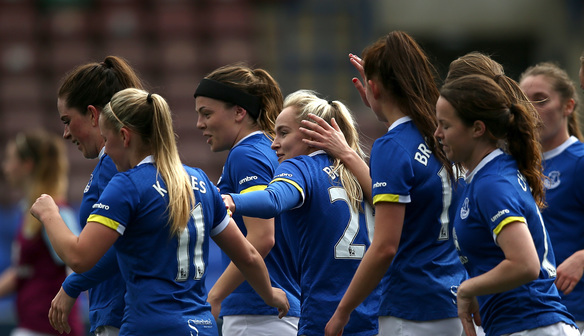 Gabby George headed Everton to victory against Durham as they leapfrogged the Wildcats to go top of the WSL 2 Spring Series table. The Blue Girls know two wins from their final two games will seal the title, after George headed in from Dan Turner’s inswinging corner on 13 minutes. Simone Magill twice missed good chances to double the lead – Rachael Laws saving one-on-one on 34 minutes before Magill somehow hit the bar from Claudia Walker’s cross moments later. Magill then headed on for Walker to race in on 36 minutes, but Everton’s top scorer was denied by Laws’ outstretched foot after sending the keeper the wrong way. Walker turned provider again on 52 minutes, pulling back for Mollie Green, unmarked in the middle, but Laws was out quick to save again. Zoe Ness came closest to levelling for Durham, meeting Beth Hepple’s 59th-minute free-kick with a powerful header, which Kirstie Levell saved one-handed. Rachel Lee then turned onto Becky Salicki’s deep free-kick on 65 minutes to fire in left-footed, but again Levell was equal to it. Captain Sarah Wilson thought she’d levelled in stoppage time, following in after Hepple’s free-kick hit the post, but the offside flag saved Everton. “Every game is a new way of working out how to win, and we’ve gone out there and done that and got the clean sheet which is good for us. We had to battle second-half for the points but you’ve got to do the dirty work to win games and we went out there and did that. “They did have their chances, but we had ours in the first-half. We had some really good chances to put the game to bed, but it didn’t work like that and we had to defend. “Obviously the Spring Series is there to win – whatever game you play you want to win, so we want to win the Spring Series, we want to win this season, we want to win every game we play in. “It was disappointing not to get the goal at the end. We created a few chances, their keeper kept them in it at times – as did ours, our keeper has made some good saves – but really we’re disappointed not to get a goal and at least a point from it. “We set up with a bit of a different formation, and were getting caught in the middle, so we’ve changed it – simply because we were a goal down – and it’s worked. Second-half I think we were a lot stronger. We took the game to them. “I think we did deserve something from the game – not to take anything away from Everton, who have put a real shift in, but the season’s not over; we’ve still got a game left, and they’ve got two.